Hmm, I guess if you ever Googled for a Domino's Pizza Rolex, you'd see that people have marveled at them before. The trick is ever thinking to Google it in the first place. Anyway, it exists, and it was apparently a reward for franchisees or managers or whomever in the early 1990s. 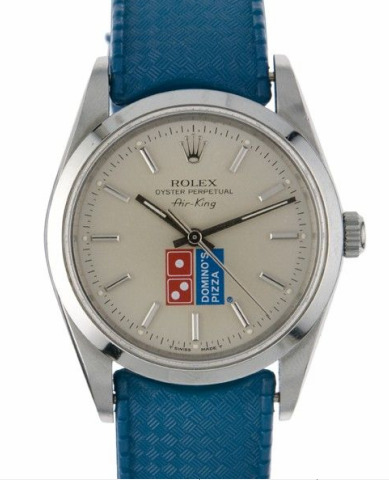 And this one being sold next month at the French auction house Artcurial has a Domino's blue leather wristband--and the pizza box, appropriately, at the 30 minute mark.